The ethical behaviour of many professionals is regulated by codes of conduct. These codes tend to vary from one industry to another. Many of the regulations, though adjusted for each industry, are similar, however. 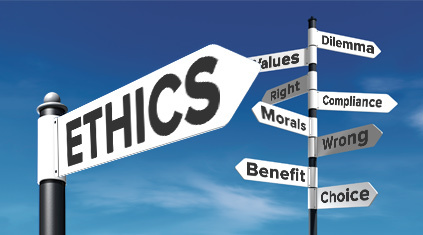 Common ethics violations include mishandling of client funds, conflict of interest, and lapsed licensing. Improper or fraudulent billing are ethics violations that can involve charging customers for services they did not receive. This happens in the medical industry, since the party who receives the bill is often not the party who received the services. The commonness of these ethics violations has led many insurance companies to issue a list of services to patients, encouraging them to report discrepancies. There are several ways a professional can commit ethics violations regarding the handling of client funds. A prime example is not placing client funds into an escrow account, which is an account where monies such as deposits are often kept. Managing such accounts is often required for attorneys and real estate agencies. If they fail to do so and place client monies into personal or business accounts, they are generally in violation. Many professionals are required to renew or update their licenses and certifications. This often requires that courses be taken or fees be paid. For various reasons, many professionals do not renew their documents in time. Since many clients do not check these things, these ethics violations often go unnoticed if a regulatory body does not discover them. Crossing sexual boundaries are ethics violations that differ from sexual harassment or sexual abuse. In these cases, both parties may be willing participants. However, something about the sexual relationship is inappropriate due to the professional’s position. This can be found in a mental health setting when a psychiatrist engages in a sexual relationship with a client he knows to be emotionally or sexually vulnerable. Conflict of interest usually involves a professional who violates her client’s trust or places him at risk of harm because of her dealings with another individual. These situations may arise with attorneys or consultants. In these instances, they may provide information or engage in activities with opposing parties that jeopardize their clients. A good example is a criminal defence lawyer who dates his client’s prosecutor. Improper handling of documentation can also be found in numerous industries. These include the financial, health, and legal industries. Many of the documents and files these professionals deal with contain sensitive and confidential information. When those items are carelessly handled or not secured according to standards, people’s privacy, finances, and safety can be jeopardized.